You're invited to RIDE THE WAVES with the dolphins on our Dolphin Slide! 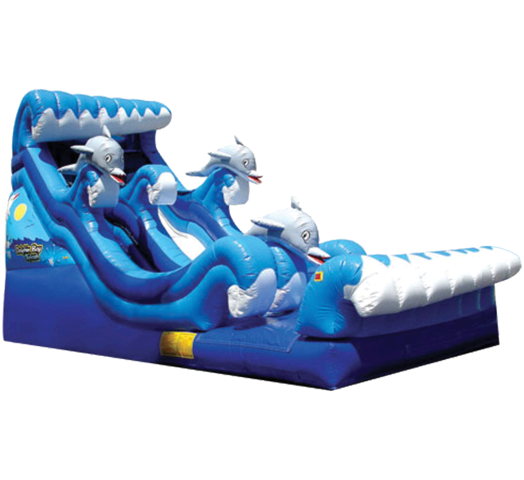 This all new design features a dynamic "roller coaster"-like slide surface giving you some quality air-time on the way down! The Dolphin Slide is two stories tall! STEPS AT PROPERTY = $5 PER STEP ADDITIONAL FEE. Must have a minimum 48" width opening access to setup area. CAPACITY: Slide can accommodate 100+ riders per hour. An adult MUST be present at ALL TIMES while unit is in use.